UCF women’s basketball head coach Joi Williams has announced the addition of Bob Starkey to her coaching staff for the 2011-12 season. Starkey joins the Knights after 13 seasons with the LSU women’s basketball program and 22 seasons involved with LSU basketball. “I can’t begin to express how excited I am about Bob Starkey joining our staff. I have known him for a long time and I’ve always respected his philosophical approach to the game,” Williams said. “Bob has always shown himself to be a passionate and inspiring teacher. He is a rare find who brings both BCS and Final Four coaching experience to UCF. “Our student-athletes, staff and the program will certainly benefit from his ability to transfer his incredible knowledge of the game and his commitment to elevating those around him to new heights. We are pleased to welcome Coach Bob Starkey to the UCF Women’s Basketball family,” Williams added. Considered one of the top minds in all of college basketball, Starkey served as the associate head coach for the Lady Tigers under Van Chancellor since 2007. 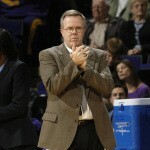 Prior to Chancellor’s arrival in Baton Rouge, Starkey took on the responsibility as the acting head coach at the end of the 2006-07 campaign. Taking over headed into postseason play, Starkey led LSU to its fourth straight Final Four appearance, defeating UNC Asheville, West Virginia, Florida State and No. 1 seed UConn to reach the National Semifinals in Cleveland. Part of all five Final Fourth berths, three SEC regular season titles and a conference tournament championship at LSU, Starkey spent 13 seasons in total along the Lady Tigers’ sidelines beginning in 1998. Before joining Sue Gunter’s staff, Starkey spent two seasons working in an administrative position with both the men’s and women’s programs. In his first role at LSU, Starkey served as an assistant with the men’s team from 1990-96. During his time with the Tigers, he worked closely in developing post players such as Shaquille O’Neal, Stanley Roberts and Geert Hammink, all first-round picks in the NBA draft. Coach Starkey continued to work with post players after joining the LSU women’s program. He was very influential in the development of Sylvia Fowles (Chicago Sky), the second overall pick in the 2008 WNBA Draft. He also coached other WNBA first round picks including Seimone Augustus (Minnesota Lynx), Temeka Johnson (Phoenix Mercury), Marie Ferdinand (Phoenix Mercury) and Scholanda Robinson (San Antonio Silver Stars). Before his extended stint at LSU, Starkey spent one year as an assistant at Marshall during the 1988-89 season and three seasons at West Virginia State from 1984-87. In his final season at West Virginia State, he helped guide the Yellow Jackets to NAIA National Championship Game. “My visit to the UCF campus was amazing. It was my first trip here and I can see the ‘wow’ factor that so many have told me about. I was also impressed meeting with Mr. (Keith) Tribble and hearing his vision for our entire athletic department. It’s already easy for me to see why UCF is such a special place,” Starkey added. Starkey is originally from Charleston, W.Va., and is married to the former Sherie Hayslett, a native of Winfield, W.Va.
Good Luck Bob, thanks for what you have done for the Tigers, I am sure Central Fla will love you as we in Louisiana did. Hate to lose a great one like you, so again, Good Luck to you and your family. I have known Bob Starkey for years. He did a tremendous job with LSU and I think UCF is very fortunate to have him. Thanks for all you have done for the Lady Tigers, Bobby! We wish you and UCF the best!